Everyone loves apple pie a la mode, this recipe takes the basic concept of an apple pie and simplifies it for those who don’t want to deal with a crust. The first step to baking apples is making sure you choose one that can hold up to baking, otherwise they’ll fall apart. 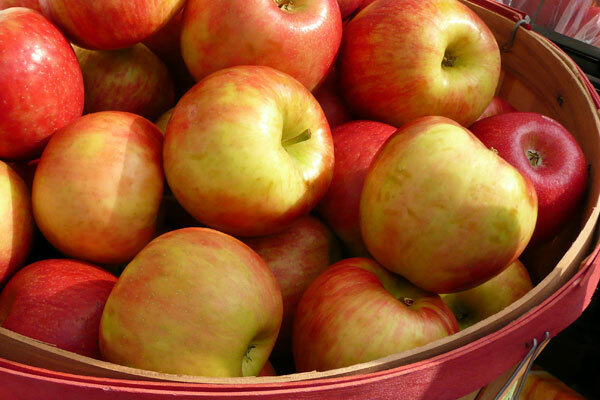 The best firm baking apples include varieties such as Granny Smith, Jonagold, and McIntosh. Very important to choose the right variety if you don’t want to deal with a real mess. You can definitely still find apples from local sources like Way Fruit Farm. Once you have the right apples, then you core them. You can use a paring knife if you have the skills, otherwise an apple corer can be had for cheap. The key is to get all or most of the core out, and not cutting the bottom to allow the melted butter/brown sugar mix to stream out the bottom during baking. I also recommend using a quality vanilla ice cream. A logical choice is vanilla from Penn State’s Berkey Creamery or Myers Dairy. - One apple for each person, again, needs to be a baking variety. - Core apples, making sure to remove seeds and as much of the core as possible. - Place on baking sheet (not a perfectly flat one, as there will be some butter leakage). - Stuff each apple with butter and brown sugar to completely fill, use about 2/3 sugar-1/3 butter ratio. - Sprinkle top of each apple with cinnamon and nutmeg. - Bake for 15-20 minutes until apple are tender. - Let apples cool to warm. - Place an apple in a serving bowl, and take a potato masher and with one press, partially smash apples. - Top with vanilla ice cream and chopped walnuts.